Yellow abrasive with press-on/flip-off center hole feature. Exclusive grit and backing are designed for jewelry applications and provide exceptionally long life. 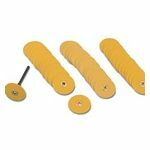 Aluminum oxide grit, mounted on thin backing, provides outstanding results in sanding and smoothing operations. The flexible backing allows accessibility to hard-to-reach areas.